At Cerisy la Foret, near St Lo in the department of the Manche, is an impressive abbey church dating from the 11th century. 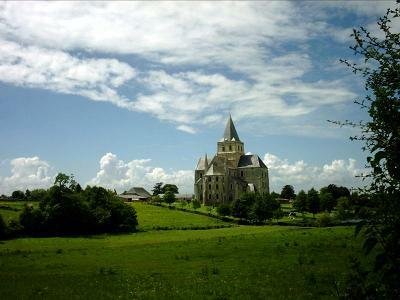 The abbey had been founded in the 6th century by St Vigor, but devastated by the Vikings in the 9th century. Ironically, it was a descendant of the Viking leader who undertook the restauration of the ruins two centuries later. Square and solid, with an architecture foreshadowing the gothic style, it somehow manages to be ethereal at the same time, as though it is floating above the landscape rather than forming part of it.